Continuing my theme from last week of catching up on overdue blog posts—today I’m sharing all about our FABULOUS week in New Orleans! We spent the last week of 2018 in New Orleans, our first time visiting the city. The last night was New Year’s Eve, which also happened to be our dear friends’ wedding. And Grace officiated! Ever since the trip Grace and I keep saying to each other how it was one of our favorite trips we’ve ever taken together. New Orleans is magical, and attending such a meaningful marriage celebration—especially in our first few months as newlyweds—is something we’ll never forget. We left for our trip 2 days after Christmas, and we were SO EXCITED! We had booked a room at the Hotel Provincial, one of the hotels the grooms recommended staying at. We loved it and would totally stay there again! It’s right in the French Quarter, and beyond charming. The cute view from our room. Our hotel had courtyards and wrought iron furniture and charming southern touches galore. It wasn’t the best weather for the pool, but it was pretty. Hotel Provincial is on the National Register of Historic Places and is supposedly haunted. We weren’t bothered though—and where better to stay in a haunted hotel than New Orleans?! The location was also just so prime. The first night, we grabbed drinks to go (such a fun novelty) and strolled around to see the charming balconies in our neighborhood! I loved seeing all the decorations still up for Christmas. Our first meal was at Cafe Amelie. So good. I got a Penicillin (traditional New Orleans cocktail) and some kind of Cajun seafood pasta. We went to bed so happy and excited to explore the next day. We woke up and strolled over to Cafe Du Monde for some coffee and beignets! There was a little line but it was well worth it. Luckily, we beat the rain and made it into the cafe before the downpour . . . but then it REALLY rained. Our strolling and sightseeing plans were temporarily put off. But right about the time when we were trying to decide what to do in the rain in New Orleans, the grooms (Tommy and Philip) texted us! We ended up going with them to get their marriage license and get Grace registered to be a marriage officiant in Louisiana. I don’t have any pics from that, but it is actually one of my favorite memories of the trip—just getting so giddy and anticipating that our friends were getting MARRIED so soon! After dealing with the official business, we decided to stop for a late lunch at Coop’s. OMG. There, I had the best po boy of all time. We continued strolling, sightseeing, tasting, and enjoying. Tommy and Philip showed us the gay corner of Bourbon Street, which was adorable. About that time, we had to split off from the guys to go on a ghost tour we had booked! There are a ton of ghost tours offered in the city, and while obviously I have nothing to compare it to, I thought the company we used—French Quarter Phantoms—was awesome. It was dark on the tour so I don’t have pictures, but we saw some really interesting historic places in the French Quarter. Whether or not you believe in ghosts, it’s a very cool historic tour. I’m also glad we did the tour one of our first nights in New Orleans, because the rest of the time we felt like we knew our way around the Quarter better and could use certain buildings (that we now knew to apparently be haunted) as points of reference. I don’t have pictures from this, but after dinner we strolled out to an awesome, tiny Cuban restaurant and got some small bites. The place, which we loved, is called Manolito. The next day, pre-wedding festivities began! We started the day with a jog along the Mississippi River, which was gorgeous. Then for breakfast on the way home from our jog, we randomly stumbled on a hole in the wall where we found the most DELICIOUS breakfast plates! We both got the fried catfish breakfast plate which came with eggs, fried catfish, potatoes, and toast or English muffins. It is one of my favorite things we ate the whole trip! The place is called Johnny’s and it’s cash only. Go there if you are in NOLA! After relaxing a bit and freshening up, we headed to the first wedding event of the week: Drag Brunch at the Country Club! It was such a fun welcome event for everyone invited to the wedding, and it was great to start to meet some of the other guests we didn’t know. The Queens were awesome and we felt so at home in a new state attending a fun drag show. Grace getting ready to hand out some dollars. The adorable porch of the Country Club. We had some r&r time after brunch (turns out, drinking during the day and eating decadent Cajun food all the time really wears you out), and then for dinner we headed to the INCREDIBLE Cafe Sbisa. Cafe Sbisa gave me one of my favorite dates with Grace, the best and friendliest service, and *maybe* my favorite meal of the whole trip (but that’s a very difficult call to make). The photo above is Cafe Sbisa’s courtbouillon, kind of a cousin of gumbo—but in my opinion, far superior. This one had a rich creole stew/soup base with rice in the middle, surrounded by lump crab meat, tiny bay shrimp, mussels, and catfish. I seriously DREAM about this meal. It was that good. The next day: rehearsal day! We started off the morning with a visit to the gorgeous venue of the wedding, the Marigny Opera House. It’s an old converted 1853 church, then an opera house, and now a venue and events space. Here’s Grace practicing her officiant role for the wedding! After the morning rehearsal, we headed to Brennan’s for the sweetest rehearsal brunch. I LOVED the idea of a rehearsal brunch so much—almost made me wish we had gone that route (as opposed to a rehearsal dinner). One of the signature drinks, pictured above, was a New Orleans breakfast punch. It was a rum punch with a milk-based base, that honestly tasted like the most delicious cereal milk imaginable. Maybe that sounds gross to you, but trust me, it was amazing. A little cinnamon on top was the perfect touch. After brunch, we strolled and explored. We had some rest time in our room (becoming a theme), and then headed to the next wedding event: the welcome party! It was such a fun gathering in the home of Tommy and Philips’ friends who live in New Orleans. It was also another chance to sample more delicious New Orleans traditional food. The cutest idea for napkins for a welcome party! One corner of this GORGEOUS New Orleans home—Grace and I couldn’t get over it. After the welcome party we left and Grace got a tattoo to commemorate our time in New Orleans. It’s a heart with a ghost in it. I feel like for many people getting a tattoo wouldn’t be such a casual thing, and I get that, but I also love Grace’s collection. That’s just Grace! As good as the food in New Orleans was, as colorful and inspiring as the city was, as sparkly and fun as having New Year’s Eve there was, none of it compares the joy of seeing our friends get married. And, a big part of that is that this was our first gay wedding as guests. Seeing how Tommy and Philip’s communities rally around them and how this was the event of the YEAR for so many people made me cry multiple times throughout the week. After we left, Grace and I commented how we felt like we’d been at summer camp and made a bunch of friends that we can’t wait to see again. It was just all so good. Tommy and Philip, thank you. We love you! 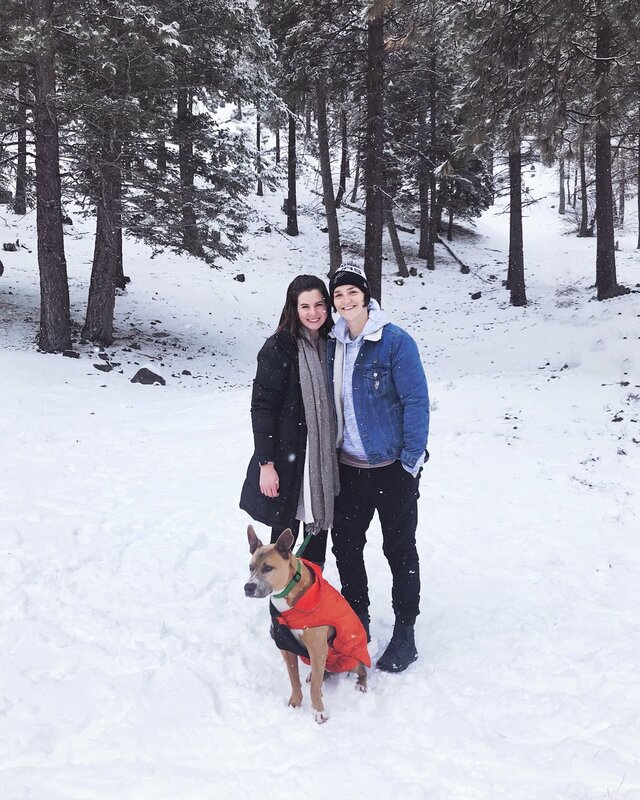 This post is long overdue, but I am so excited to share about my roadtrip to Palm Springs this past December with my best friend—and two of our dogs in tow! I’ve written about visiting Palm Springs here and here, and honestly, I don’t think I’ll ever get sick of Palm Springs. This trip was especially sweet because it is part of a tradition my friend Sarah and I have of going on trips together to dream about our goals and renew our friendship. In the past we have gone to Asheville, NC, the Chesapeake Bay, Lake Arrowhead, CA, and now Palm Springs. Culling through photos from the weekend to write this post, I was getting chills remembering what a beautiful, restorative, and life-giving weekend we had. Making it a priority to get away for “bestie weekends” is sometimes hard in the hustle and bustle of life, but so worth it! Photos in this post are a mix of iPhone photos (taken by me) and DSLR photos (taken by Sarah). Chances are, the really pretty ones are taken by Sarah! We stayed at the Ace Hotel in Palm Springs, and it was my second time staying here—I love it and would definitely keep going back. Best of all, it’s super dog friendly! On the way, as any good California roadtrip starts, we stopped at In-n-Out for dinner. We got to our room and got settled in for the night! We had booked a room with a patio and outdoor fireplace, which was a huge highlight. We spent the first night chatting and enjoying some rosé! Both our boys (I brought Bean, and Sarah brought her corgi Butters) got cozy for the night. We are both early risers (something I love having in common with Sarah) so we got a jump on our one full day in Palm Springs and went to Cheeky’s for brunch! I’d been to Cheeky’s before and it’s amazing, but it always has a long line. We got there by 8:30 and there was no line, and we got to sit right outside on the patio with our dogs. Heaven. Little oranges (I think?) growing on the property at the Ace. So lovely! The pups situated at Cheeky’s. My bloody mary served in a glass boot! My order: the vegetarian tamale plate. Plus a flight of bacon!! After breakfast we headed to the Palm Springs art museum trail to do a quick hike. It’s a gorgeous but STEEP trail (which we didn’t quite realize), and to be honest, it was a little difficult for both of our dogs. So we walked up a little ways and then headed back, and that was fine with us! The views were still amazing even though we didn’t hike the whole thing. After going back to our room at the Ace, showering, and dropping off the dogs to hang out inside during the warmest part of the day, we set out to the Moorten Botanical Garden. I firmly believe no trip to Palm Springs is complete without a visit here. It cost $5 to go and it is THE coolest place. It’s a botanical garden, including an awesome, funky greenhouse, filled with the most strange and beautiful plants imaginable. The colors, shapes, textures, and patterns are amazing. I could truly spend the whole day here. They also have some baby cacti and other plants that you can pick up to take home! Sarah ended up getting a few things that are now living happily in her apartment. We went shopping for a bit after Moorten. Downtown Palm Springs is super charming, and we shopped for some Christmas gifts and I also got a Dole whip. Yum! We’d initially planned to go out to dinner, but once we got back to the Ace after an afternoon of exploring and shopping, we were so content we didn’t want to leave! We canceled our dinner reservations and dined on delicious snacks and cocktails by the pool, followed by a room service dinner. The next morning we woke up and knew we needed to check out by 11am, so we took a slow morning staying in the room (after walking the boys), ordering room service breakfast, and dreaming about our 2019 goals. My order: an everything bagel, two eggs over easy, and soy chorizo! Sarah’s order: a bagel with lox and pickled red onion. We also both got coffees and date shakes. Date shakes at the Ace are my FAV!! And there you have it—a simple, sweet, dog-friendly trip to Palm Springs shared between two best friends. Palm Springs is one of the easiest and most TRULY dog friendly getaways in Southern California, in my experience. I cherished this weekend and can’t wait to plan the next one. One of the items on my winter bucket list was to see snow. Having lived in California for going on six years, I very rarely see snow and have been missing it! When I wrote it on my bucket list, I honestly had no idea how or when it would happen. I thought we’d most likely have to take an overnight trip up to Tahoe or something like that. While a Tahoe trip would be amazing, I wasn’t sure if it was in the cards this winter. But after we got back from our New Orleans trip I had the idea to research whether it snows anywhere in Southern California. I quickly realized that there were several places we could go! I picked Wrightwood, California, for its proximity to LA and lack of mountain driving (meaning we most likely wouldn’t need snow chains on our tires). This gives you an idea of how close Wrightwood is to LA—making a day trip possible. We decided to bring Willie with us since he had never seen snow (at least since we adopted him-we don’t know much about his life before that). It was SO FUN! Our little snow day is definitely a favorite memory of 2019 already. Here are some favorite pictures and details from the day! Our schedule for our snow day was to wake up, drop Bean at daycare (chihuahua in the snow = unhappy chihuahua), and hit the road. We stopped for some snacks on the way (Swedish fish are always a must for me on car trips). By mid morning, we were in the middle of a snow storm! It was hard to believe since we’d woken up in sunny West Hollywood. 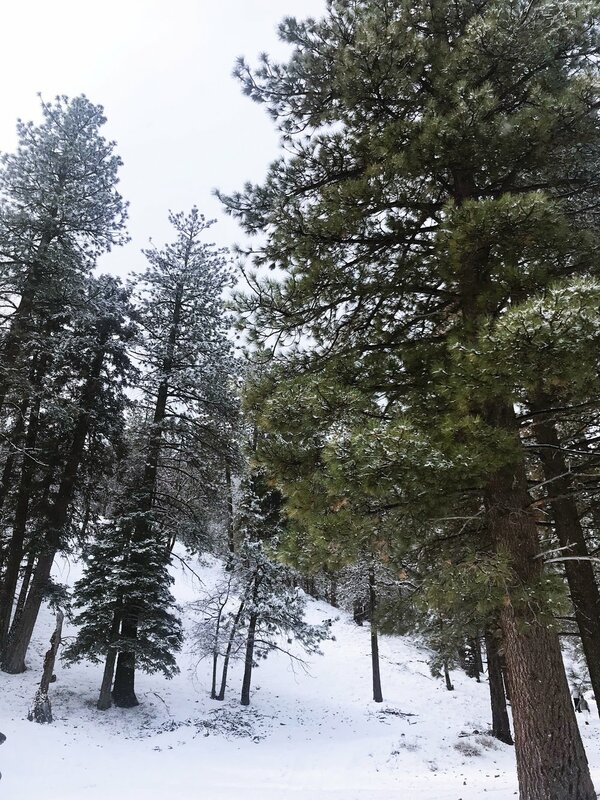 Wrightwood felt like a perfect choice because while a few other people had the same idea as us, it wasn’t nearly as crowded as I’ve heard Big Bear and Lake Arrowhead can be in the winter. We put a local market into our GPS because I’d read that you have to buy a forest parking pass to park on the side of the road in a Wrightwood. We’ve done this in Big Bear in the summer before too. But when we got there, they said we didn’t need one because there are no rangers patrolling because of the government shutdown. So so weird. Anyway, we then headed up Angeles Crest Highway (in basically a blizzard at this point) and parked on the side of the road. This was right by the Mountain High skiing area. We walked into a big meadow/clearing where kids were sledding and people were having snowball fights and we just frolicked! I am very happy to report that Willie LOVED the snow! We had a coat for him but weren’t sure if he would be too cold, as he is a short-haired, perpetually tan, SoCal boy through and through. But he was sooo excited! Throwing snowballs for him to bite was hilarious and he was just prancing so happily. We definitely want to take him to see more snow in the future-he did so great. This past weekend Grace and I drove up to Ojai for my birthday, and I am so grateful. Leading up to this trip, even though it had been booked for weeks, I refused to let myself be excited for it. I've been in the busiest season of my life and honestly a bit down--feeling like it's impossible to count on any plans or set good boundaries with work. Up until we were physically in the car driving to Ojai, a big part of me didn't believe the trip would happen. But I fought for it, and it was so worth fighting for! A couple days before the trip, I asked Grace if we should still go, given that I'd probably be working a good bit of the trip and had been in a stressed-out mood for days. She said it was my call, but she reminded me that road trips are our sweet spot, and what sets us on fire as a couple. I knew she was right and we had to make it work. I feel very humbled by the fact that this trip happened at all, and the down-to-the-wire nature of whether we'd get to go actually set me up for a really beautiful experience of letting go of control with planning trips. Normally, for a weekend getaway, I'd spend a good bit of time researching the area and having a few options in mind for each meal or activity, and maybe even some advance reservations. But because I didn't know until that day whether we'd actually get to go, I didn't spend any time planning ahead, and it was actually SO special. Everything felt really magical, like we'd just stumbled upon things, whereas if I'd researched in advance, it would have lost a bit of that wonder I think. I'm not saying I'm now totally converted to only spontaneous travel--I did book this hotel weeks in advance after all--but I think it was really meant to be that we got to just wing it. For example, on Friday night when we drove up, it turned that there was an oyster food truck right in the parking lot of the hotel! We'd already eaten dinner on the road, but we decided to get some raw oysters as an after-dinner snack, and they were SO good. It put me in the best mood and just felt so FUN--an oyster food truck steps away from our hotel room--how cool and serendipitous is that?! But had I researched in advance, I would have seen that it was on the hotel's schedule, and I would have pressed Grace to make sure we got there in time to go to it. We ended up getting there only 20 minutes before the food truck was supposed to leave, which would have stressed me out had we been counting on going to it, but because I didn't know in advance, it just felt like perfect timing. And had the truck driven away before we got there, well, ignorance is bliss. It's a good reminder, especially with our honeymoon coming up, that knowing all the local hot spots in advance can actually minimize your ability to stumble upon something and make the trip your own, not the internet's version of the perfect trip to that area. Now with that dose of travel philosophy out of the way, here's the recap of our trip! We stayed at the Ojai Rancho Inn, which is now our favorite place in Ojai! This was our third trip; we previously stayed at the Ojai Valley Inn and Spa and a Hipcamp treehouse in Ojai. By the way, if you have never heard of this small town and are perplexed at how to say the name, it's pronounced like this: OH-hi. Kind of like Ohio, but without the "o" at the end, and the emphasis is on the first O rather than the hi. Hence lots of "Oh hi, Ojai" puns. It is a beautiful, lush town in the foothills, historically an artists' community. Similar to Palm Springs in some ways, but more of a green hilly feel than the desert like Palm Springs. While we had a fabulous time at both the Ojai Valley and the Ojai treehouse in the past, we both agreed that Ojai Rancho just felt like the "Goldilocks" of places in Ojai. The Ojai Valley was our first foray into all that Ojai has to offer, and it's really special that we got to go there with Casper. But it's more of a golf course resort/pool scene kind of place, which is fine, but a little bit less our style. It's also slightly more removed from Ojai town, which is SO cool. The Ojai treehouse is also incredible but VERY removed from town (up a mountain), and rustic. I would totally go back there for camping, but it's not ideal if you want to explore the actual town. Having the piano in the room was clutch because Grace is working on tracking for her new record. Psst--you can get in on her record early here. Since we don't have cable, watching House Hunters when we're on vacation is one of our guilty pleasures. If you're curious, the room we stayed in was the King Garden Cottage. It's the only one like it at the hotel, and if you stay at the Rancho, I HIGHLY recommend the little bit extra it costs to rent this room. The other rooms seemed nice from pictures, but this one is a little bigger and more special. You also have direct access to the pool from your room (which we didn't use, but would be perfect if traveling with kids), and out the other door, you walk straight out onto a little patio and green space for your dog. Plus, the piano, cool leather sofa, and record player make a stay all the more unique and cozy. I think the other rooms are more like traditional hotel rooms with just a bed, though some have a Jacuzzi, which ours didn't have. I didn't take any photos of the bathroom, but it was nice and big. Since we didn't have any plans in advance, we decided to just explore the town and have down time in our room, pretty much alternating those two things the whole weekend. It was great. The first night we stayed in and had the above-mentioned oysters. The first morning we ate breakfast at the Marche Gourmet Delicatessen--so good and friendly! Super European, right in the middle of Ojai. Ojai is a very small town and easily walkable, though old man Willie was a little tired. We saw the sights and then headed back to the hotel for some rest time (after our extremely busy morning, clearly). Ojai has the prettiest tile work everywhere. I love it. Walking around Saturday morning is when we really started to both say we could see ourselves living here. It's not that we don't love LA, but we are the type of people to think about retirement when we're 27, and this is exactly where we want to be when we retire. And maybe even buy property earlier than that so we can fix it up and spend time on the weekends there. A part of me even wants to move to Ojai to raise a family, because it seems like such a great place to do that. But that's probably not in the cards in the immediate future. Anyway, after some down time in the afternoon, we ventured back out on the greenway for dinner. We had a few names in mind of places that had outdoor seating for Willie, and ended up selecting The Nest, which was a really cute place with a nice patio. The food was yummy. Grace got an anchovy margarita pizza and I got calamari tacos. I also had one of my favorite cocktails I've had in a while there. The one I got was called the Ventura Fog, which was fitting because it was a pretty foggy/chilly weekend. It was made with earl grey infused gin, lavender, meyer lemon, and egg white. It reminded me of a lavender macaron, but not super sweet, which I always prefer in drinks. After dinner we got some fro yo and walked back to our home away from home! Walking along the greenway, we passed right behind a local amphitheater with an event going on, and we heard some familiar tunes trickling through the trees. I looked up the schedule for that amphitheater and saw that it was actually the band Vampire Weekend playing. I had never heard them live so we lingered a little bit on that part of the walk, thinking how fun it was to unexpectedly hear a band we knew playing in the park in this little town. It was a sweet, simple night. We drank some champagne when we got back and randomly watched the original Jurassic Park which was on TV. I'm not sure if I'll see the new movie coming out, but the original has always been a favorite. The next day was my birthday! And also the one year anniversary of Casper (our first dog) dying. It felt really full circle to wake up on my birthday and hug Willie (last year I was awoken on my birthday at 5am to basically Casper's last moments/getting really sick) and just feel grateful for all the healing--and new fur babies--we've had in the year following Casper's death. I opened some gifts and then we checked out of our hotel and drove to the Ojai Coffee Roasting Co. for breakfast. It was definitely the hot spot in town that morning (which was also Father's Day), and Grace waited in line while I sat outside with Willie. We got some lox, a really good PB&J, a parfait, and some coffee and a chai latte for me. It was all delish. And after that we headed back to LA! We clocked how long it took for us to get down to the coast, and it was only about 15-20 minutes. That was also a big selling point on our plans to move to Ojai one day--I think of Ojai as being more inland, but it's actually quicker to the beach than where we live in West Hollywood! All in all, the weekend away was just what we both needed. I honestly could have spent a week at Ojai Rancho Inn, and we hope to go back for a longer vacation soon! I can't wait to spend more time in Ojai and get to know it better. We feel like we just scratched the surface of all there is to do there. Ojai also has a big wine scene with a bunch of tasting rooms, which is something I would love to try out next time. If you are looking for a getaway in Southern California that isn't a far drive but feels like a world away, I cannot recommend Ojai enough. The sign below says it all--Ojai vibes are very real! And then there was the green safari tent pictured above, plus a bathroom! The bathroom was SO cool. It was built onto the side of a rock, so it was a little treacherous to get there, but it was all part of the adventure :) Plus, having a flushing toilet and a sink to brush your teeth in while camping was incredible. Never thought I'd post a pic of a toilet on my blog--but I've never seen one with a view!! Best bathroom view I've ever had. In case you can't tell from the pictures, the bathroom actually had privacy from the campsite area--the open air part of it only faced out to 160 acres of empty space! It was such a unique and cool concept. This Hipcamp is private, so we had the whole mountain to ourselves. And for those who haven't used Hipcamp before, it's like Airbnb but for private campsites. This is probably our 4th or 5th time using it, and every experience has been awesome! This campsite even had super fast WiFi and electricity! Let's talk about camping food. I like to eat really well when we camp, but also not spend a ton of precious daylight hours prepping. For our dinner, I made a super yummy one-pot meal that used some seasonal ingredients, too! Here's the recipe: 1 cup orzo and two cups water in a deep cast-iron skillet on a propane camp stove on medium-high heat. Also add in (all at the same time) 1 small chopped yellow onion and 1 bunch of asparagus, cut into bite-sized pieces. I'm not normally the biggest asparagus fan, but they are in season in California and so tender and delish right now!! Bring everything to a boil, stirring frequently, and then turn down the heat a little and cook until all the water is absorbed (you don't need to drain this). I also stirred in some onion powder, fresh thyme, and red pepper flakes. When it's all absorbed, take off the heat and stir in about half a cup of pine nuts and half a cup of parmesan cheese, whether vegan or dairy. I added a little salt and pepper on top at the end. It was honestly so good, Grace loved it and was going back and scraping the pan clean. Of course, we had to roast some marshmallows after. Dandies is one of our favorite brands, and it doesn't have any gelatin in it. Can you believe how perfect this natural outdoor fireplace is?! Grace made a great fire, as always. I don't know how she does it so perfectly every single time. I might have to get her to write a guest post on that topic at some point. For breakfast the next morning, I kept it simple (and tasty) and toasted some bread on the stove and made peanut butter-banana toasts and avocado toast. A bit of lime and salt and red pepper flakes are the keys to great avocado toast, in my opinion! This trip was over too quickly, but it was so sweet. We got to play scrabble, look at the stars and the city lights in the valleys below, work on our wedding vows a bit, soak up alone time together, and of course adventure with our dingo dog Willie. We boarded Bean because I was nervous about taking such a small dog to such a wild location, and I'm glad I did. He would have been scared. We want to expose him to camping for sure, but this was not the location to do so! We need to test the waters in the proverbial baby pool first. We would HIGHLY recommend this spot for camping and would go back, but I do have to caution others about the rough road. It is not for the faint of heart, even if you do have 4-wheel drive. I was literally sweating as we drove up the mountain. But if you are experienced in off-roading, it's so worth it! For reference Grace has a Subaru SUV and we have done worse road before, but this was high on our list of "worst." The Sub could handle it, but I just want to caution people. I'll leave you with a few more favorite pictures from the weekend! It was impossible to take a bad picture in this stunning place. Last weekend, Grace and I went to Texas for the first time! We were there for a wedding, which was held about 30 minutes outside of Austin. We got to see a little bit of Austin itself, too, which is a city I'd always wanted to visit. We weren't there for very long, so we'll definitely need to go back--but we got to see some highlights, plus spend time with my whole family (that's my little brother in the pic above!). As we were getting on the plane in LA, it struck me how weird it felt to be getting on a plane with Grace! We travel together so much, but we so rarely fly (hence the title of this blog). In fact, the last time we took a plane ride together was coming back from a trip to Belgium, where Grace is from, in spring 2016. So it had been a minute. Side note: Grace is SO funny on an airplane and going through security. Those who know her, know that Grace has truly never met a stranger. She will talk up anyone and everyone she meets. That includes the TSA officers doing a full pat down (yes, she had to get extra screening--of course). And she loves to put on her headphones and dance in public on purpose to embarrass me. I make fun of her, but traveling with her is the best. As we were going through the unfamiliar experience of flying together, I started thinking about the pros and cons of taking trips without the dogs. It's much more of a hassle (because we have to figure out what to do with them when we're gone), but there's something to be said for it in a different kind of way. So I'm going to recap our trip and then reflect below on how I felt about the experience! On Saturday we woke up and got kind of a late start because of the time change (Austin is 2 hours ahead of LA, so 10am felt like 8am to us). My parents were already up, and my mom texted me around mid morning, saying, "Is Sudie in Austin? I think I just saw her walk across the hotel lobby!" Sudie was one of my college roommates and best friends, and she's going to be in Grace's and my wedding later this year! So it was so fun to run into her. I actually knew she was going to be in Austin the same weekend as me, but we both had a lot going on and hadn't figured out a way to meet up yet. So it was perfect that my mom literally ran into her. I texted Sudie and we ended up meeting up and spending the morning together with my family! It was such a fun surprise. Before we had to start getting ready for the wedding, we walked all around SoCo, which is an area of Austin that my parents had heard was cool. It really was! We loved strolling, window shopping, and eating. Some of our favorite stores were Lucy in Disguise with Diamonds (an AMAZING thrift/costume shop) and Allen's Boots (where the picture below is from). In another life, if I were Texan, those pink boots in the middle would be mine. After strolling, we stopped in at Torchy's Tacos to eat. We'd heard it was one of the best places to get Tex Mex tacos in Austin, and it was SO unbelievably good!! I'm still dreaming about their fried avocado tacos. Omg. Because the venue was about 30 minutes away from Downtown Austin, we had to head back to the hotel after lunch to get ready and hop on the shuttle! I wish I'd taken more pictures of the venue, because it was BEAUTIFUL. Now that Grace and I are engaged, I tend to notice things at weddings with a much closer eye, and this venue is totally somewhere I would want to get married if it existed in LA. It's called the Addison Grove, and it's a barn and surrounding grounds with the prettiest grove of trees for the ceremony. There were also a bunch of longhorns right to the side of where the cocktail hour was held, including a baby that was SO cute! The wedding had a ton of really sweet touches. For one, when we arrived at the venue, servers passed out mugs of the most delicious hot chocolate! I thought that was the cutest touch for a wedding a cold day. We are planning on doing something similar at our wedding, except with refreshing lemonades and agua frescas because it will be summer. The reception in the barn was magical. The band was really good and did a great job covering a ton of different genres. We are also getting a band for our wedding; I think they bring a really fun element to the reception. The couple actually had the same first dance song as we're going to have! I'll keep it a surprise for now, but it was cool hearing how a band would cover it, and we thought it was such a fun coincidence that they had the same first dance song as us (since it's an old song and I haven't heard anyone have it for their first dance song before). I don't have any more pictures from the weekend (I was putting a lot of things on my Instagram story and forgot to save them! ), but after the wedding we went out to a place called Container Bar in Austin. The bride & groom wanted to keep the party going so we all headed there! It was a bar made entirely out of shipping containers. It was pretty cool and the street it was on, called Rainey street, was VERY hopping on a Saturday night. The next morning we met up with one of Grace's friends who lives in Austin, and we went to breakfast at Texas French Bread. I had the breakfast tostadas, and it might have been my favorite thing I ate all weekend! After that it was pretty much time to head to the airport and get back to our pups waiting in LA. 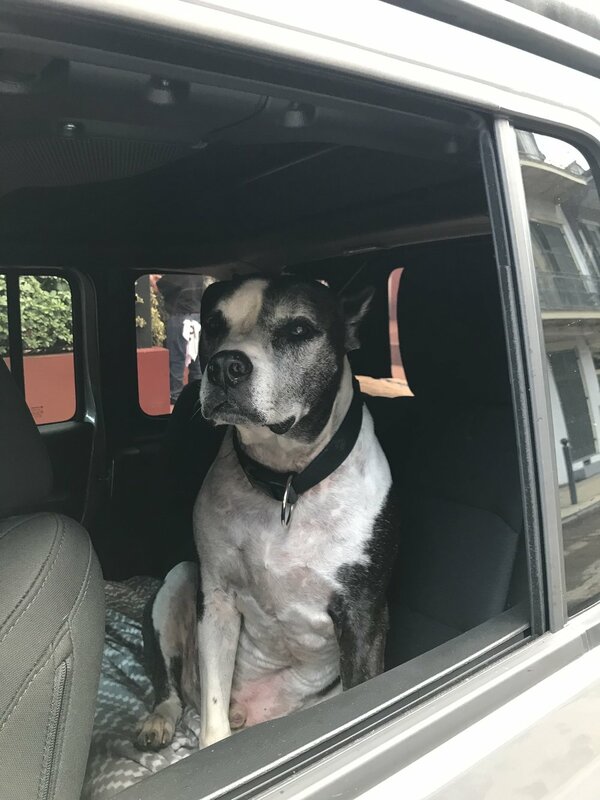 Speaking of which, now to my thoughts on traveling without them--overall I think it's good and important to sometimes travel without our dogs. What I'm about to say might be an unpopular opinion, and I hope it doesn't sound cruel; that's not my intention at all. But as I get ready to marry Grace, we have to take a step back and get perspective every now and then. I LOVE our dogs. But if everything goes as it should, our marriage will far outlive them. So, I think it's important sometimes to connect just us. This trip also helped me see how important that will be for our honeymoon. I had been toying with the idea of planning a honeymoon we could bring the dogs on, but after traveling by ourselves for a weekend, I really think it's important that we take our honeymoon without them, to just focus on each other. All of that being said, road trips with the whole family will always by my favorite. And, when we leave, it's SUPER important to us that we can leave our dogs in peace and not worry. We had our good friend Sara stay with Willie at our house, and he had a blast. We boarded Bean to make things easy since he's still a puppy. And they both seemed to have a great weekend! Don't worry, this isn't about to be a blog about how Grace and I go on all these trips and just leave the dogs. We will still mostly travel with them. But it's nice to know that we can go away for a weekend and they will be okay--and we'll be better for it. On a different note--I know I had a bit of a hiatus from blogging over the past two weeks or so, and I hate that. I have a TON of ideas and hope to keep the posts coming more consistently. Thanks so much for reading! Quick Trip to Palm Springs with (TWO) Dogs! If you follow me on Instagram, you might have seen a pretty exciting announcement over the weekend! It's true--Grace and I adopted a new little fur baby and we are very smitten with him. That said, it's been a journey with highs and lows that I am looking forward to thoroughly documenting here in the coming weeks. Little Bean (full name Jellybean Jones Baldridge--if you get the reference, we are friends) has turned our world upside down, and raising a puppy is no easy feat. But seeing Willie become protective of him and groom him is so heart-melting. I promise that soon I will post ALL about how we came to adopt Bean, similar to my post about adopting Willie. And, I'll write a separate post introducing his personality (similar to my Meet Casper and Meet Willie posts) once we get to know him a little better! But in the meantime, I wanted to write a post about our trip to Palm Springs a couple of weeks ago. I shared some pictures on Instagram from Palm Springs, and it was funny because I had to be conscious not to share Bean in any of them! He was with us, and many of our friends met him that weekend. But, we decided not to post anything about him online during our adjustment period. I've been to Palm Springs in the past and written about it here, but this was my first time with dogs! It was so fun. Several of our friends brought their dogs too, so it was one big dog party (the best kind of party). We were there celebrating our friend Sara's birthday. And because we all stayed at the Ace Hotel & Swim Club, dogs were allowed, which was awesome. This post is not a review per se of the Ace, nor is it in any way sponsored (ha), but that said we spent the majority of our time there. I would definitely stay at the Ace next time I go to Palm Springs over anywhere else I've been, with the exception of maybe the Parker. I think the best dog-friendly thing about the Ace is that dogs are allowed on the pool deck! I think they have restrictions when it's hot (as they should), but it was a balmy 75-80 degrees while we were there. It was so fun to have all the dogs hanging out on the loungers with us and chilling by the pool! The hotel staff even brought us water bowls for our pooches. Can you spot all 4 dogs in this pic?! There were a total of five over the whole weekend. So fun. For our room, Grace and I opted for one of the rooms with a patio and outdoor fireplace. It was SO worth the little bit extra per night. It was so lovely to have our breakfast in the morning by the outdoor fire, and it was nice to have the dogs be able to hang out there too. We ended up getting upgraded to a suite (which also included the fireplace) and it was AMAZING! Our room even came with an acoustic guitar, which Grace loved playing. Speaking of breakfast, if you stay at the Ace and order room service, GET THE DATE SHAKE! OMG, we loved it and convinced all of our friends to order it, too. I thought the avocado toast was just okay, not my favorite. Most of our weekend was spent hanging by the pool, which was just what we needed. We ate at King's Highway, which is the restaurant at the Ace, and it was great. We also went out in the evening to a Palm Springs gay bar that was SO FUN--everyone had a great time and danced so much. It was called Hunters. Most of our group at Hunters. It was a short, simple weekend, but it was so good for the soul. This fall has kicked Grace's and my butts with work, moving, wedding planning, and more, but this weekend in Palm Springs really reminded and convinced me of how important it is to take time to get out of town and spend time together. Bean did great on the 2 hour car ride to and from Palm Springs, so we want to keep exposing him to road trips so that he gets used to it and loves them like Willie does! Stay tuned for lots more about Bean soon! This past Sunday, Grace turned 27. I always LOVE celebrating Grace's birthday, and we have done various things for it throughout the years. Last year, we went all out with a huge group camping trip in Joshua Tree. It was so much fun that we initially thought we'd do something similar this year, but when the time came, we decided to do something more low-key with just the two of us. We have been in such a whirlwind season of life--the busiest and fullest I think I've ever experienced--and so Grace's request was that we get away for the weekend with Willie and go somewhere relaxing, with a spa and fluffy robes. I decided that I would make the destination a surprise, and I started brainstorming where we should go! I knew I wanted to keep the getaway within 3 hours of LA, since we'd be leaving after work on a Friday and didn't want to be driving late at night. I looked in all directions; some places I considered were Santa Barbara, San Diego, Idyllwild, and Paso Robles. But, I kept coming back to Pismo Beach (or nearby Cayucos) as the place that I thought Grace would love most. We had spent the night in Pismo Beach on a camping trip down the California coast a couple of years ago, and we've always said we wanted to go back. It's a super cute beach town with incredibly stunning cliffs, beaches, and sunsets. For those who haven't been, it's about halfway in between LA and San Francisco on Highway 101 along the Pacific. After researching hotels with a few parameters in mind (dog friendly, spa on site, fluffy robes in room, good room service menu, etc. ), I settled on The Cliffs Resort. I booked us some spa services and basically planned nothing else--I knew that relaxing and enjoying the amenities were at the top of Grace's list for the weekend! Because of Daylight Savings Time making it dark so early, it was fully nighttime when we arrived at the resort on Friday evening. We pretty must just checked in and went to sleep, enjoying our little in-room fireplace and watching some TV but figuring we'd wake up in the morning and experience the grounds and see the ocean. The resort really could not have a more perfect location. By the way, there were three resorts all in a row: the Spyglass Inn, Dolphin Bay, and finally The Cliffs where we stayed. We had a great time at The Cliffs but would also totally try out one of the others the next time we go to Pismo . . . they all looked unique in their own way, and this blog post is in no way sponsored or biased towards The Cliffs, haha! The best thing about any of the resorts that are in that area is the view and beach access. We were a 3 minute walk from our room to the beach, which was so lovely. Also, many beaches in the LA area don't allow dogs, but Pismo allows them! So it was really fun to bring Willie down to the beach with us and let him enjoy all the smells. But Mom, I really WANT to disturb the seals! This is probably the least adventurous trip I'll recap on the blog, but this was basically all we did the whole weekend! It was awesome. We walked on the beach, sat out on our little patio and enjoyed the sea breeze, ate our meals either through room service or the on-site restaurant, Marisol (which had the best seafood mac n cheese EVER), stayed up and watched Saturday Night Live in our room, and rested. On Sunday morning we got massages at the spa, which was literally right next door to our room. We left The Cliffs feeling so blissed out, I am now fully convinced that resort/spa getaways are just as important as camping and connecting with nature! Also, this was a very dog-friendly resort. They had a dog bed for Willie, water and food bowls, treats in the room for him, and even a doggie room service menu! I'd say the one downside is that when you have a dog, you don't get an ocean view room (because all the dog-friendly rooms are on the first floor where you have access to a grassy area right outside). That said, the amenities for dogs and the fact that we could see the ocean from just walking right outside were worth the trade-off of having a terrace view rather than ocean view. Lastly, I'll leave you with some pictures of the sunset we saw on Saturday night (to me it was the best gift from above possible for Grace's last night of being 26). The last time we stayed in Pismo Beach, we saw the most beautiful sunset I have EVER seen in my life, and this one rivaled it. I don't know what it is about Pismo, but the evenings are otherworldly in how special they are there. We love you, Pismo Beach! We'll be back! One of my favorite things we ever did with Casper was take him to Yosemite. I described the trip a little bit already in my post about my Top 5 Favorite Road Trips, but I get questions all the time about going to Yosemite and have been wanting to write about it a little more in depth. Also, people often assume that you can't take dogs there. You totally can! It just takes a little more planning. Every now and then I talk to someone who hasn't heard of Yosemite. In case you're in that boat, it's a national park. One of the gems of America. It is located in Eastern California in the Sierra Nevada mountain range, about 5 hours north and slightly east of LA and about 3 hours east and slightly south of San Francisco. Yosemite was one of the first national parks created (only Yellowstone is older) and was really central to the development of the whole concept of having national parks in this country. It is pristine, inspiring, stunningly beautiful, and one of the most amazing and special places I have ever been. I highly recommend it to anyone, as there is something for everyone there. When we went we saw families, solo travelers, people with pets, people using wheelchairs, elderly people, little kids, and everything in between. It is truly amazing! It's one of the things that makes me proud of the United States. When Grace and I went we kept saying "this is like Disneyland but for nature." So incredible. On the topic of pet-friendly Yosemite trips, I guess I'll start out by explaining what you can't do with a dog. The main thing is that you can't go on any unpaved trails. I'm sure some of those trails are really awesome and worthwhile. But I can tell you from firsthand experience that there was plenty to do staying just on the paved trails, and I don't feel like I missed any iconic Yosemite views or experiences by being limited with a dog. Yes, maybe if you're going to Yosemite for a weeklong trip with your whole extended family, it might be tedious to be restricted to the paved trails. But for a two-day trip like ours, there was more in the park than we could ever do in that time and keeping to the paved portions didn't bother us one bit. The Yosemite website has a great page describing the areas where you can go--when they say "paved," that includes portions of the trails that are wood-planked, as well as bridges. Look at these responsible Yosemite visitors, staying on the paved pathways. You also cannot take the shuttles around Yosemite if you have a dog (I'm assuming this would not apply to service animals, but I don't have any personal experience with that). Just to give you a picture, Yosemite is HUGE and you could never walk it all in a day or two. You have to get transported between all of the different sights to see and trails to walk. There are two primary options for getting around Yosemite: driving your own car and stopping at each location/trailhead or parking your car at a central location and then taking the shuttles around the park. I think that most people elect to do the latter because it is less stressful (you don't have to look for parking spots which can be hard to find). But that's not an option with a dog, so that's something to be aware of. Other than keeping your dog on a leash and using doggy poop bags, the two things I describe above are really the only dog-related rules for Yosemite. That said, I think they are pretty strict and you can get fined for violating them. But besides for keeping those in mind, there is SO much you can do with your pup in the park, and it's such a cool experience for them and you. If you watched Grace's many Instagram stories of trying to get Casper out of bed or have read my other posts about him, you know that he was not a fan of exercise or long walks. He was an old boy and had a hard life before we adopted him--can you blame him for just wanting to kick back and relax?! But when we went to Yosemite, it was a totally different story, and it was amazing to see. In one morning, he walked 4 miles without a complaint. SO wild for him! I think it was a combination of the cooler temperatures (in the 50s and 60s while we were there), the interesting new sights and smells, and the excitement of the adventure and being included with his moms that kept his energy and mood high. It made me so happy to see him so full of life and energetic. I felt the same way in such a beautiful place! First, try to travel in spring or fall. Winter is beautiful, I've heard, but the areas of the park that are open are a lot more limited because of the weather. Summer is SO crowded. We went in March, and it was absolutely perfect. A few roads and trails were still closed from winter, but it was mostly areas that we couldn't take a dog anyway. The crowds were totally manageable. And the weather was sublime. One other benefit to going in spring over fall--the ice from winter is starting to melt, and as a result all of the waterfalls are flowing in full force. Second, embrace the 5am wakeup call. Seriously. It was my dream to see sunrise over the park, and it was SO worth the early wakeup. A really great thing about Yosemite is that it doesn't close overnight. It is open 24 hours, so take advantage of that! You can get there as early as you want, and I recommend going as soon as it's light outside. We had no line going into the park (there is a ranger station where you have to check in and pay the fee--about $25 for a weeklong pass, I think), but on the way out later that day, we passed about a MILE of cars waiting to get in. The early bird truly gets the worm at Yosemite. Getting up early and traveling in the spring rather than summer allowed us to have such a peaceful experience--plus, we got some amazing photos of us surrounded by zero crowds in some of the most iconic Yosemite locations! Tunnel View. It gets its name from the tunnel you drive through right before coming to it. This isn't a hike-in spot; it's right on the side of the road. This is the most iconic, postcard picture/perfect spot in Yosemite--see the waterfall in the back righthand side of the photo?! It's just unreal. Bridal Veil Falls. This is probably the largest/most impressive waterfall in Yosemite that you can get close to with dog. You can feel the mist on your face when you walk up to it! There is a short hike in to get to it--more like a pleasant stroll, really (it's paved). This photo and the photo below are just of a little creek that you pass by on the "hike" in to see Bridal Veil Falls. Everything in Yosemite is beautiful--not just the destination at the end of the trail. This picture as well as the next two below are from the Lower Yosemite Fall Trail (I believe it's also known as the Valley Floor Walk). Yep, that's snow still on the ground in March! Mirror Lake. This spot is probably tied for first with Tunnel View as the most beautiful place I've seen in Yosemite. It's so peaceful and, for lack of a better word, reflective. Can you spot tiny Grace and Casper on the left side of the photo below? This and the two photos below were taken on the Cook's Meadow Loop, an easy stroll through the meadows of Yosemite with beautiful views of mountains and waterfalls in the distance. It's a magical place. For anyone who's curious, we stayed in this dog friendly Airbnb located about 20 minutes outside the park. There are lodging options within the park, too, but they tend to be more expensive and were all booked by the time we planned our trip (we planned this only a few days in advance--spontaneous travel to Yosemite is totally possible, but you'll probably need to stay outside the park gates like we did). If you have any dog-friendly tips and tricks for Yosemite that I haven't mentioned here, I'd love to hear them! I can't wait until we can go back with Willie. This weekend was really special in a lot of ways. It's a first and a last: first road trip with Willie, and last weekend getaway before leaving on our month-long road trip to Alaska. It was also our first getaway since Casper died. The weekend felt full-circle in many senses; to me this sweet time together was our redemption song after the heartbreak we experienced the last time we took a trip. Summer is normally my favorite season, but this one has been marked by loss and has just been a difficult season for many reasons. But summer is almost over. And I have seen time and time again that joy comes in the morning. We had originally planned to venture into Santa Cruz, check out the beach, and do some sightseeing during the weekend. But once we got to our destination, we just didn't want to leave. The road coming in was navigable but a little bumpy, and we decided it would be a lot more relaxing to stay at the cabin for the whole weekend. I'm so glad we did. We played about 15 games of Scrabble, napped, enjoyed the soaking tub, ate well, and talked and dreamed about our upcoming Alaska road trip. Over fresh caprese salads and local peaches one afternoon, we brainstormed packing lists and planned our last to-do items before the trip. As much as it pains me to say it, Grace insisted that I include in this blog post that she was the overall Scrabble champion of the weekend. This might seem like just a pretty picture, but there's a story behind it. One of my best friends, Caroline, gave me a beautiful bottle of rosé for my birthday this year. I brought the bottle with me on our Joshua Tree getaway, but I never got a chance to drink it because Casper died that day. Bringing the bottle with me to the redwoods and sipping it in such a beautiful setting, with Willie waiting for us in the house, was another full-circle moment. Another really nice thing about the cabin was that it had a piano! Grace has an amazing ear for music and can pick out most tunes on piano or guitar. Some of my favorite memories from the weekend are me cooking dinner while Grace played us music (she brought her guitar, too). For food, I brought a big cooler of stuff and cooked most of our meals. The cabin had an adorable, old fashioned gas stove. The first night, we decided to order in pizza from Big J's in Corralitos, which amazingly delivered up the tiny mountain road to the cabin. We LOVED it and would highly recommend it. On the way into town on Friday, we also stopped at the Corralitos Market and Sausage Company, where we picked up some fresh produce, seafood, and locally-made ice cream. We loved this getaway. While we didn't "do" much, just getting away from it all was heavenly. Also, the much cooler temperatures in the mountains were so lovely compared with the heat waves that have been plaguing LA. On Sunday morning I woke up to walk Willie, and we were literally walking through a cloud. Even at 8 or 9am, fog shrouded the cabin and surrounding trees, making it so cozy and atmospheric. Thanks for reading! One last photo--Willie's request.